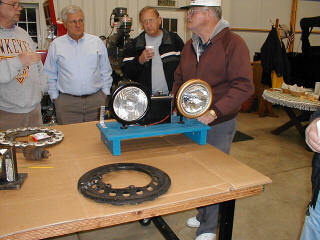 The May meeting was held at Jack Putnam's shop in Bluffton. Bob Torbet led the meeting with 15 members and guests in attendance. The treasurer's report was read and approved. Bill Phillips reported on the tech meeting at his home during April. He thanked us all for getting his coupe running. We really didn't do all that much. Bill had everything that we needed right there ready to install. It was fun re-teaching Bill how to drive his car. He was on his own within 15 minutes of his first lesson. The idea of some summer touring with an island tour sometime in September or October is still alive. Certificates for the charter members of our Model T Ford Club International chapter were handed out and the club MTFCI charter was handed over to Jack Putnam. The information and maps to the Toledo Botanical Garden were handed out. 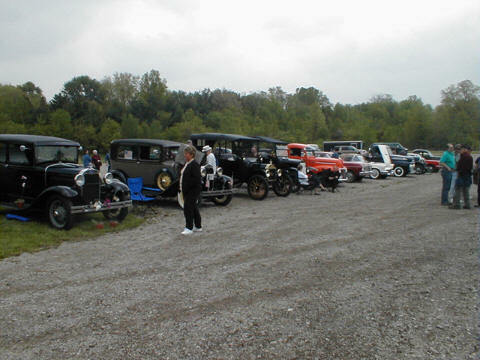 This was the location of the Ford 100 Year Anniversary celebration that was held in Toledo, Ohio. Ken Stucky and Jim Cook ended up attending the event along with a good group of T's and A's from the Toledo area. Another upcoming event is a Ford celebration at Findlay Ford. Stan would like us to come to Findlay to help celebrate the 100 Year Anniversary instead of going all of the way to Detroit. He will provide lunch and Ford Memorabilia for those who participate. The date is Saturday, June 14th at Findlay Ford Lincoln-Mercury. Dennis Russell's RR will be open at the same time, giving rides to the kids and adults too. 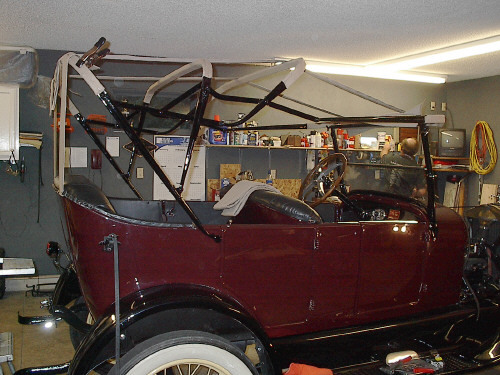 We are into the active Model T season with a lot happening. Parades, Tours, and Car Shows can keep us busy with whatever we're interested in. 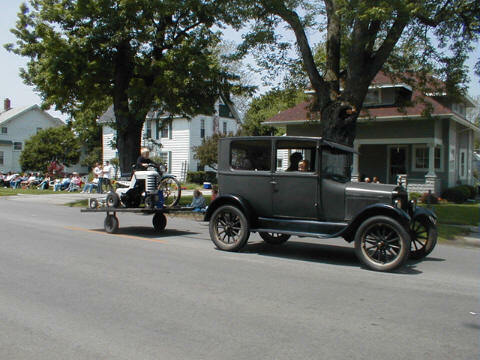 Take the time to get out there and do a little active Model T driving, riding, or watching. We have a lot going on this summer from the little show coming up in Findlay to the Major event in Detroit from the 12th to the 16th of June. The Central Ohio group will be doing a one day Tour of the Columbus area for anyone interested in a short tour. Ken Stucky and Jim Cook braved the elements to help make the Ford celebration in Toledo Ohio a success. The day was a mix of overcast and sunny; but, mostly cool. 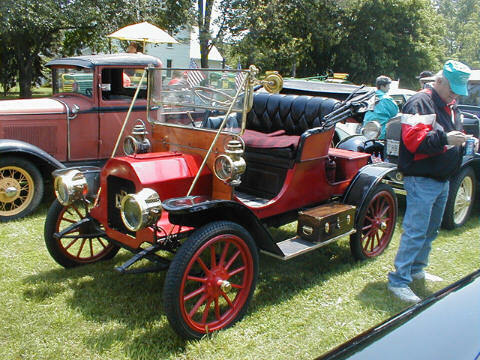 There were Fords there ranging from a 1914 model T to a 1965 Mustang. 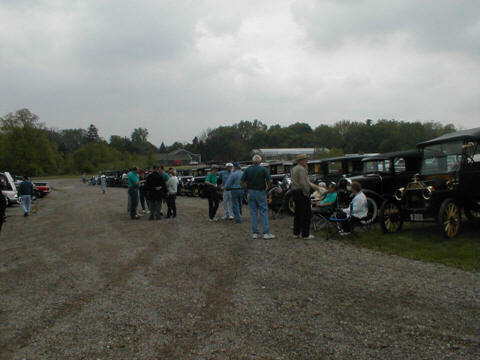 The largest contingent was the Model A Club of the area. 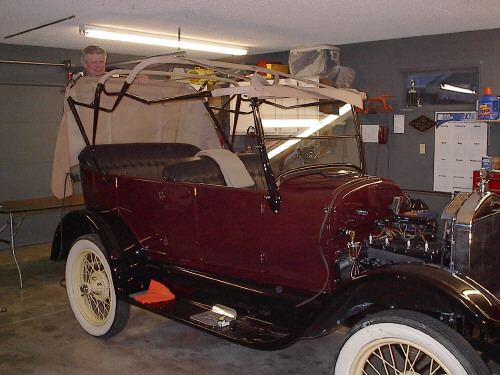 Ken had the privilage of parking next to John Gottschalk, a veteran Model T'er who has been on many national Model T tours. Boy does he have some stories to tell. 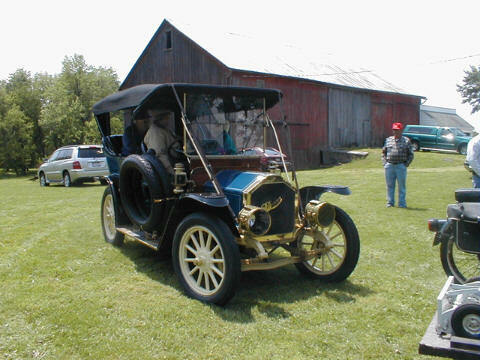 His 1915 touring is a fine example of a driveable show car. Jim on the other hand would rather drive than sit; so, he agreed to spend the day driving people around the Botanical Garden in his car. It made the day go a lot faster. 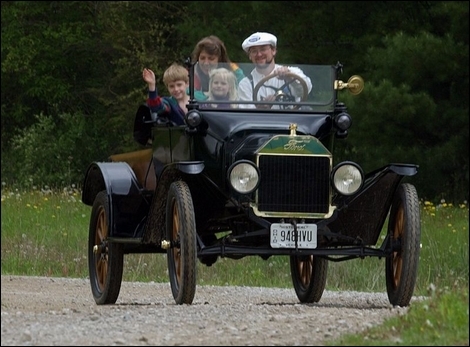 Jim Cook takes Sidney Anderson, 8, Kelly Anderson, 5, and their mom, Janet Anderson for a ride in a 1916 Model T Roadster at the Ford celebration at Toledo Botanical Garden. doesn't have a chance. Its all trial and error until the top is finally in place. 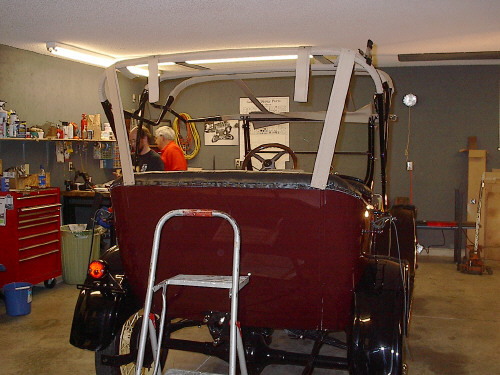 Meanwhile the other crew worked on fitting the engine cowl and the front bow sockets where the bow ties into the windshield. This is where the nice coat of paint became a bit of a problem. The other trouble spot was the cowl hinges. 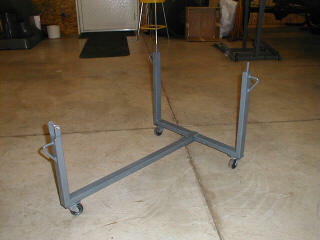 Bob thought that he had filed away enough metal but we were breaking paint all over the place. 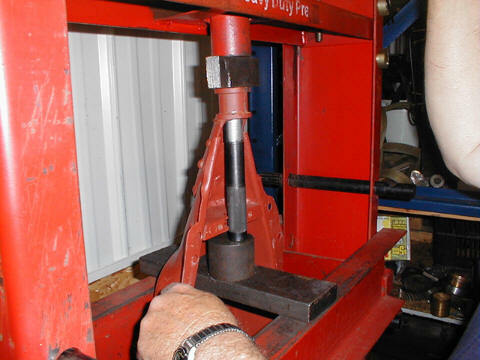 Installing a new front nose bushing is relatively painless if you have the proper tool to drive the bushing into the iron casting. 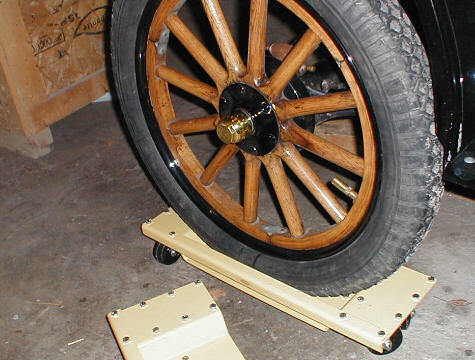 The bushing is driven from underneath with a stepped pin and stopped by a flat top block. There is little or no reaming needed in this operation. 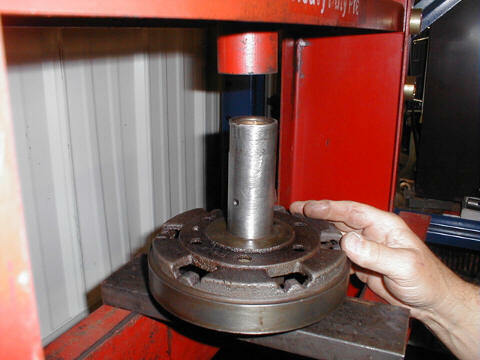 The bushings that hold the alignment of both the crank and universal are pressed in from the ends of the transmission. 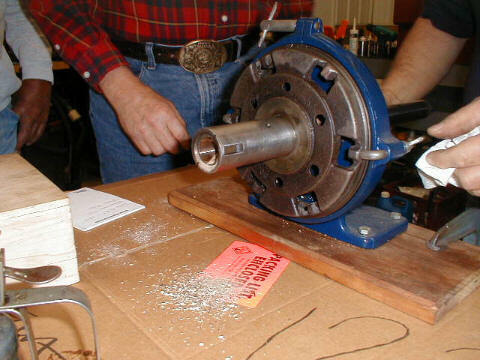 The small end must be set just inside the radius for all of the parts to mate properly. Don't take shortcuts here. A mistake can cost a lot of time. 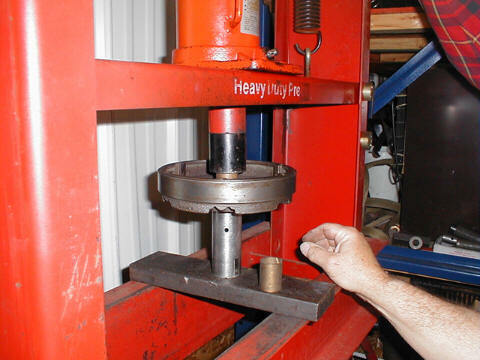 Once the bushings are set, they must be reamed with a special reamer for proper clearances. The special fixture shown in both of these pictures ensures that everything is in perfect alignment. 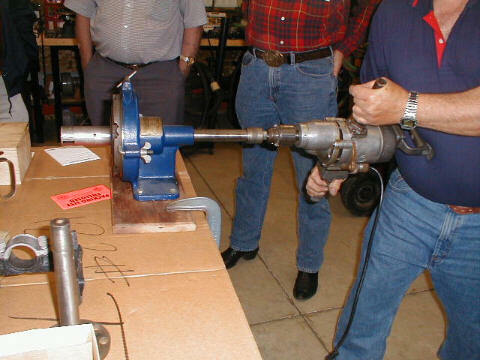 This drill will grab and send the operator flying if he is not holding on.